Below are links to websites where you can email letters to Santa for free. Some websites say that the big guy will even email you back! Many of these websites have games, trivia, history, and more so be sure to take a look around! Please be advised that I have not personally used any of the websites below and therefore cannot comment on the reliability of the site or quality of the email you may receive back from Santa. This website takes a break from your usual “I want this for Christmas” letter and allows you and your child to stop and think about how you’re making the world a better place and let Santa know about it. They have ideas to help you with your mission and gifts you can purchase that make a difference.You can also print free downloadable coloring sheets, and find some great ideas for your ”Happy Birthday, Jesus” cake. *The-North-Pole.com Santa Mail: Send your letter to Santa directly to the North Pole via free email and get a reply by email! Also on this website you can read about the birth of Jesus and the history of Santa, learn about Christmas around the world, play games, Sing-a-long Christmas Carols, and more. *EmailSanta.com: Use this website to send a free email letter to Santa. In addition to telling Santa what you want for Christmas you also get to choose a stamp and select a goody to send with your email (such as Hugs and Kisses or Reindeer Food). While you’re there be sure to check out the rest of the website. I really enjoyed reading Santa’s Tweets (he was tweeting a lot about my hometown…so excited!). You can check to see if you’re on the Naughty or Nice List. They also have free printable coloring pages and much more! *NorthPole.com Mailroom: This website allows you to send a free email to Santa and he’ll email you back! 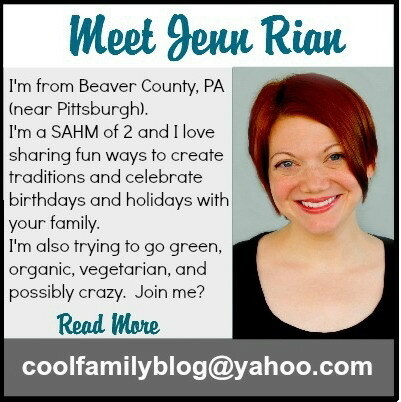 You can also send and receive animated post cards and have a Santa send you a Birthday e-card (this would be perfect for those with a Christmas birthday to feel special!). If you were really good this year Santa just might send you an Elf Pal Academy Award or Diploma. Take a peek in Mrs. Claus’s Cookbook if you’re looking for a new recipe (there are a ton of them!). There are secret places in the Reindeer Barn that will take you stories about Raymond the Reindeer and his friends. You can read a personalized story about yourself online or print a story book! *SaintNick.org Letters: This is another website that lets you send a free email to Santa and he’ll email back. On SaintNick.org you can learn about different Christmas traditions around the world. If you’re into Reindeer Games you can start a Snowball Battle by sending a friend a Snow Gram. If you need a snack after your virtual snowball fight you might one to try out one of these free downloadable recipes and then read about the Physics of Santa. *Claus.com Post Office: Type out your free email message to Santa and select a stamp. Santa will email you back! ”CLAUS.COM is the oldest and most popular Christmas website on the Internet. It has become the Internet’s first Christmas tradition, and it attracts millions of kids and parents every year. Santa Claus and his helpers have created a truly creative experience for kids of all ages. There are lots of things to see and do that you won’t find anywhere else. And you’ll also enjoy the most colorful illustrations on the entire Internet! Look over this quick guide to the site, and then click any of the links on this screen, or return to the village screen and click on any of the buildings.” Be sure to check back on Christmas Eve to find out how close Santa Claus is to your house using Santa Scope™ and Santa Monitor™. *Santa.net Letters: At Santa.net you can email Santa directly from your email address, send Santa a free email through the website, read cute letters to Santa from other children, or make a Christmas list. There’s sing-a-long Christmas music, tons of games, and an online coloring page. *Letters to Santa Claus: This website offer tips for writing your letter to Santa, Email Santa, Kids Santa Letters, Letter Template, Write Santa a Christmas Letter. *Santa-at-home.com: Send Santa a free email and he’ll email you back! 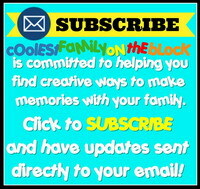 Crafts, recipes, games, and more can be found here. *BlackDog’s Christmas Fun and Games: You can email Santa and join in many of BlackDog’s Christmas fun and Christmas Games! *OperationLetterToSanta.com: Email Santa, he emails back! This website also has Christmas Carols, Sheet Music, and midi’s, Christmas tales, traditions, and more! There are even pages for Halloween, Thanksgiving, and New Years! *SantaSearch.org: Jingles, one of Santa’s elves from the North Pole, has the special task of making sure all of your letters and e-mails get to Santa so he can send you a very special letter! Does your family ever email Santa? Below are links to free printable letters to Santa, letters from Santa, and other free printable Christmas themed stationary. You will also find links for letters to Santa kits and stationary to be purchased. Please be advised that I have not personally printed or used any of the free products below and therefore cannot comment on the quality of the printed product. Please scroll for letters TO Santa, Wish Lists, and Christmas Stationery. 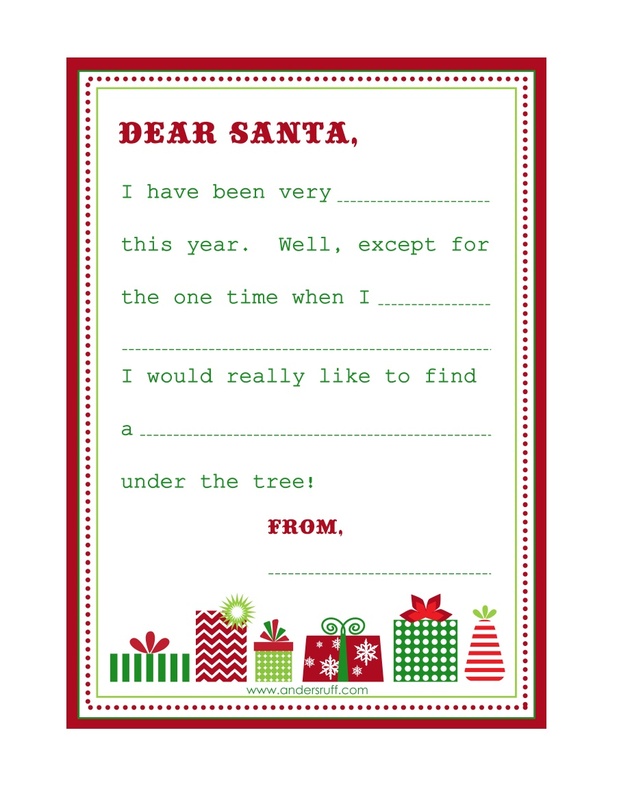 The Macy’s website has free printable stationary that you can use for your letter to Santa. You can also create your letter on their website and “draw” on the letter and add “stickers” before you print it out…what fun! There’s also a free Activity Guide and School Toolkit. Here’s an adorable “Dear Santa” letter that you can print out for your letter to Santa. You can also find free printable Christmas Wish Lists here. This free Dear Santa letter folds over like a card. Print it or download the pdf. A free printable “Dear Santa” letter from Parents.com. This site also includes free printable Christmas money envelopes and paper with angels and doves. Please be advised that I have not personally purchased or used any of the products below and therefore cannot comment on the quality of the product or reliability of the company. Also, any prices listed are obviously subject to change at anytime causing the amount written here to be different. As always please use caution when purchasing products online. *Official Letter to Santa Kit – Set of 4 by Chickabug: The kit includes: 4 5″x7″, 4 handmade pre-addressed labels, 4 bright red envelopes. *Write to Santa Kit $14.95: Inspire the true giving spirit of Christmas with this lovely holiday kit. Naughty or nice, all children will be eager to write a letter to Santa with this irresistible new kit filled with stationery, a self-inking stamp, storybook, stickers, and more! If you know of other free printable Christmas paper for letters to Santa please let me know in the comment section below so that I can update the list! Thanks! Mailing a letter to the North Pole is a beloved Christmas tradition. If you’re looking for a way to make your child’s letter to Santa a special experience, you’ve come to the right place. Now that your child has finished writing their letter to Santa you need to get it to the North Pole. There are many different ways to get a “Dear Santa” letter to the North Pole; you just need to find the one that works best for your family. You know how much available time you have, your budget, and most importantly you know what your children will enjoy. Before choosing how to get your letter to the North Pole you need to decide if you’d like to have your child’s letter as a keepsake. If you do, keep in mind that letters sent to Santa through mail or North Pole Wind are unable to be returned, however, letters sent to Santa through magic are able to be collected by the elves and returned to you for safe keeping. *If you send a letter to Santa through magic you can request that it be collected by an elf once Santa is done with it and returned to you for safe keeping. You can then save these treasures in a special book to give to your child when they are older. Elf Express Delivery: If you have an Elf on the Shelf or an Elf Magic Elf, or a personal family North Pole Elf, they would be happy to deliver your letter to Santa. Some elves prefer that you first put your letter into a small magical mailbox in your home. They will later retrieve the letter and deliver it to Santa personally. Santa or Elf Pick-Up: You can leave your letter to Santa somewhere in your house for Santa or one of his elves to pick up during the night. Some more popular places are by the fireplace, under a pillow, or in your shoe. If Santa comes to visit you on the Eve of St. Nicholas Day (December 6), you could leave your letter for him that night. you be unable to retrieve a copy as a keepsake. Chimney Delivery: In Britain some children burn their letters to Santa on the fire and the ashes and smoke travel up the chimney and are magically transported to the North Pole by the wind. This isn’t as common today since there are fewer working fireplaces and it poses safety and environmental hazards. Balloon Delivery: In Mexico and other Latin American countries, children tie their letters to a helium balloon and release them in the air where it will magically travel to the North Pole. This method may not appeal to those more environmentally cautious. you will be unable to retrieve a copy as a keepsake. Use Macy’s Mailbox locater to find a store near you. Their website has free printable stationary that you can use for your letter to Santa. You can also create your letter on their website and “draw” on the letter and add “stickers” before you print it out…what fun! There’s also a free Activity Guide and School Toolkit. *You can mail your letter to Santa through the post office at the following addresses. Many post offices have special Santa letter drop off boxes located on site. Letters going to the North Pole through the Post Office should be mailed no later than December 08 in order to receive a reply from Santa in time. I’ve found several different addresses online for North Pole, AK but I’m not certain which is the most current. I’ve included them all below. You should contact your local post office with any questions. The most current information from the USPS is found here (from 2018). This is a great list of North Pole and Christmas related postmarks and zip codes! Don’t forget to take photos of your kids as they’re writing their letters. Other important snapshots to take are holding up the finished letter, and putting the letter into the mailbox. If you will be sending your letter by mail, through Macy’s, or via North Pole Wind, you will be unable to retrieve your letter and will need to make a copy. You can take a photo of the letter, scan a copy of it, or make a photo copy of it to have as a keepsake for scrapbooking. You can hand write or type a copy of the letter, however, you won’t have your child’s handwriting or any drawings they’ve included. For this reason I recommend also taking a photo of the letter or scanning it. Consider sending a copy to the newspaper or local records and landmarks department. Be sure to save a copy of the clipping if your child’s letter gets published. *If you send a letter to Santa through the mail you might receive a letter back from Santa with a North Pole Postmark! Letters going to the North Pole through the Post Office should be mailed no later than December 15 in order to receive a reply from Santa in time. Of course, sending a letter through magic is a more certain way of receiving a response from St. Nick since there aren’t as many time delays. Below are some places online where you can purchase the special North Pole Postmark that letters from Santa bear and stamps that Santa uses when replying to children. Please be advised that I have not personally purchased or used any of the products below and therefore cannot comment on the quality of the product or reliability of the company. Also, any prices listed are obviously subject to change at anytime causing the amount written here to be different. As always please use caution when purchasing products online. *NorthPolePostmark.blogspot.com – Free! : Free North Pole Postmark! Go here to right click and save the postmark image shown at the top of this post. This can be printed onto an envelope. *SantaLetter4You.com – Free! : Free North Pole Postmark and Stamp…choose from two! Go here to print the postmark image onto an envelope. *Personalized Santa Letters – Free! : Go here for free North Pole Postmark clipart and free printable letters from Santa. How does your family get Santa’s letter to the North Pole? Share in the comments! Writing a letter to Santa is a beloved Christmas tradition. If you’re looking for a way to make your child’s letter to Santa a special experience, you’ve come to the right place. Remember to choose what works for your family. You know how much available time you have, your budget, and most importantly you know what your children will enjoy. Choose a date to have your children write their letters to Santa. Some of the more popular choices are Thanksgiving Day, Thanksgiving weekend, December 1, or December 5 (The day before St. Nicholas Day). Everything is more fun when it’s more festive! To set the Christmas mood play Christmas music, wear Santa hats or Christmas themed clothing/pajamas, drink hot cocoa or apple cider, and eat Christmas cookies. When you’re finished with the letters, watch a Christmas movie or read a book (bonus points if the story is about writing a letter to Santa!). For a simple letter you’ll need the basics: paper, writing utensils, envelopes, and stamps (optional). If you’d like to kick it up a notch consider the following ideas. *Writing Utensils: Crayons and markers are the popular choice, but you could also use glitter or gel pens if that’s something your child would enjoy (although some of these are difficult to read). A simple yet festive alternative to the every day writing utensil is to use Christmas-themed pens/pencils with Christmas toppers. For craft-loving kids have them decorate their writing utensils with glitter, stickers, poms, tinsel, etc. (Don’t let them go too overboard and be sure they don’t gunk up the tip…they still need to write with it!). Consider having a special official “Letter to Santa” pen to use every year. This could be purchased or made. Be careful with some of the cheap themed Christmas pens as the ink doesn’t seem to last from year to year 😦 . Please remember to always use age-appropriate writing utensils and supervise younger children. *Envelopes: If the kids will be making their own cards, make sure you have an envelope big enough to fit it or have them keep their card letter-sized and foldable. Add stickers or drawings to the envelope but stay away from glitter and such as the letter will be handled by postal workers. Consider putting a Christmas themed stamp on your letter to Santa. This is optional as we all know that Santa will always receive our letter even if there’s no stamp! If you have photo-stamps of the kids that would make it particularly special (bonus points if that photo is from a previous Christmas!). Tomorrow I’ll be writing about mailing your letter to Santa, so be sure to check back for more ideas. For many children the focus of the letter is their Christmas Wish List, but many parents are encouraging their children to be more personal (and less greedy) with the jolly old elf. Below are some ideas of what they can write about. *Start off by greeting Santa. *Ask about other favorite North Pole residents such as Mrs. Claus, Rudolph and the other Reindeer, Buddy the Elf, Frosty the Snowman, Jack Frost, or Suzy Snowflake. *Tell Santa about the year you had, something fun that happened, or any new milestones like getting/losing a tooth, starting school, or welcoming a new sibling to the family. *Tell Santa about your favorite things such as your favorite color, food, Christmas cookie, book, movie, hobby, or subject in school. *Tell Santa about your behavior. Be honest and give him examples of the good or bad things that you did and why you deserve to be on the nice (or naughty) list. *Tell Santa what you want for Christmas. Give your child a number of things to ask for such as “no more than 3” and explain that Santa doesn’t always give us everything that we ask for. *Tell Santa about Jesus’ birthday and how you will celebrate it. *Leave a question for Santa in the P.S. If your children are too young to write, you’ll have to write the letter for them while they tell you what to say. There are ways to keep your non-writing children involved in the letter writing. *Have the children sign their name by holding onto their hand while you form the letters. 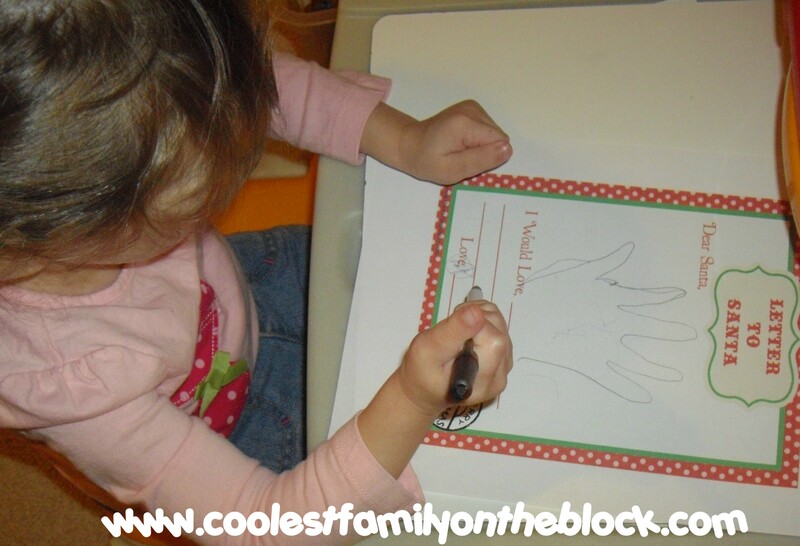 *Include a hand print, finger print, or hand tracing. If you already do this as part of another Christmas tradition…just make another one for Santa! Don’t forget to take photos of your kids as they’re writing their letters. Other important snapshots to take are holding up the finished letter, and putting the letter into the mailbox. If you can record some video footage consider “interviewing” your child asking them what they’re telling Santa. You can use this same technique once the letter-writing experience is over to have the kids either tell you on tape or write down what they thought about it. Give them some prompts such as what was your favorite part about writing to Santa? You may get answers like “I liked drawing Santa a picture or it was really fun to put the letter in the big mailbox.” This will give you an idea of what the child enjoyed, what to make tradition, and what to skip (Did you try decorating the pencils and your child didn’t mention anything about it? Then you could probably skip it the next year and it won’t be missed.) Remember to write your child’s age and the year somewhere on the letter. Adding things such as the hand prints or drawings mentioned above are an added keepsake if you’ll be keeping the letter rather than sending it away. Some parents take this opportunity to teach their children proper letter writing etiquette. When Christmas is over, have the kids write Santa a thank you note. For children still learning to write you can take this opportunity to help them practice their handwriting. For those of you interested in having your child write a formal “business” letter to Santa Claus check out this website Write a Letter to Santa Claus or do an internet search for more information. If you really want to do something unforgettable for your kids you should probably contact Santa and let him know that you want this year to be very special. He just might surprise you by dropping off a package for your kids with special materials in there just for writing him a letter. Of course, just like you, Santa knows your kids and your family very well so he’ll be certain to include just the right stuff. Maybe Santa knows that just sending some stationary, envelopes, and stamps would be perfect for your family. Or maybe he knows that you’d like something a little more involved. For the craft-loving child he may include the supplies for a hand-made letter to Santa and perhaps even some things for decorating their writing utensil. Santa knows if your kids like to bake with you in the kitchen, so he might just send you a new recipe and ingredients for a cookie that he’d like you to leave for him on Christmas Eve. He might just help you capture that Christmas spirit by sending along a Christmas cd, book, or movie, some cocoa, or your very own Santa or Elf hats. Santa knows that most kids love to color so I wouldn’t be surprised if he included some coloring sheets. Of course, Santa will be sure to send you the envelopes and stamps needed to get your letters back to the North Pole. And you never know, he just might send your kids very special “Letter to Santa” pens only to be used while writing letters to the North Pole. Santa is really very clever with how he delivers these packages. Sometimes he sends them through the mail, sometimes he leaves them on the porch, sometimes he leave them by the chimney, sometimes he leaves them at the foot of the bed either while the kids are sleeping or while they’re at school, sometimes he’ll have an Elf on the Shelf or an Elf Magic Elf deliver them. One thing’s for sure…no one ever sees him do it, but sometimes you might just hear his sleigh bells. Does your family have any traditions for writing letters to Santa? Please share in the comment section below! I am a grandmother with three grown children and three grandchildren. I am also a serious Precious Moments collector. And although my kids think Mom has gone bananas, I have over one hundred Precious Moments to help me relive those very special precious moments that are but a memory when our children grow and leave home. To add more fuel to the fire of their minds that told them Mom is stepping off the deep end, I announced to everyone that I wanted to adopt my own Preemie: Not one that belonged to my granddaughters, but one of my very own. As an avid Precious Moments collector, I have become accustomed to looking for those hard to find-just have to have figurines. And so…my search began. 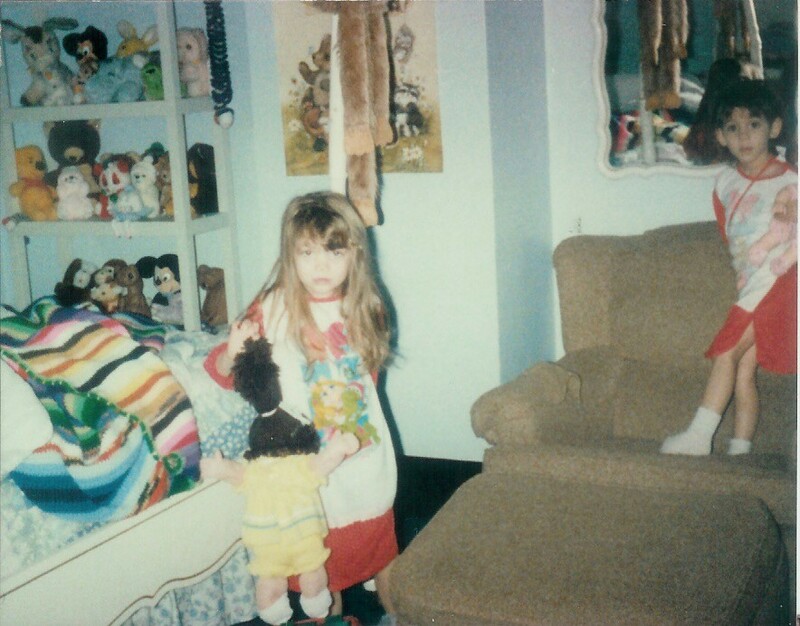 Sear’s, Penny’s, and Montgomery Wards were all among my list of places to call in my unrelenting search for my very own Preemie; but my pleas fell on deaf ears. They wouldn’t even take my order! I followed every lead, every hint of a lead, only to be disappointed time and time again. Disappointed, but not yet defeated, I continued my search. My desire to adopt my very own Preemie prompted me to call my two daughters, who live in Florida, to have them place orders there. They did so, but again, no promises. No closer to my goal, the summer ended. The holidays were upon us. In November our local newspaper was printing letters from children to Santa Claus. My two granddaughters, Jenny, five, and Jessie, four, insisted that I help them write their letter to Santa. Now, the newspaper, having been flooded with letters from anxious children said they had all the letters they could print for the remaining days until Christmas. I explained this to the girls, but they, like their grandma, were persistent. I, being a grandma who loves and spoils her grandchildren, gave in. 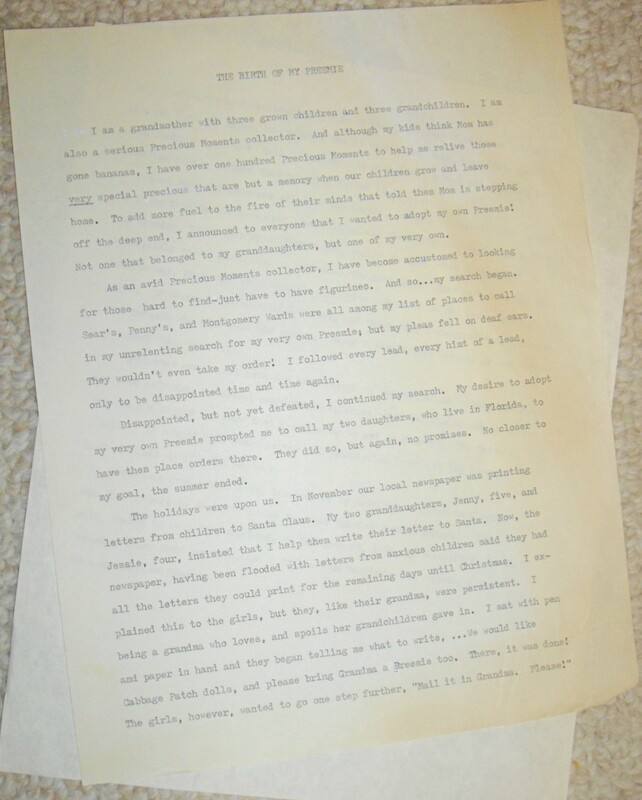 I sat with pen and paper in hand and they began telling me what to write, …”We would like Cabbage Patch dolls, and please bring Grandma a Preemie too”. There, it was done! The girls, however, wanted to go one step further, “Mail it in Grandma. Please!” were now the words I was hearing. Even though I was sure that the letter would not get into the paper, how could I resist those four, big, beautiful, pleading eyes looking up at me? Well, I couldn’t (a weakness I’m sure all grandmas are familiar with); to make them happy, I mailed it in. 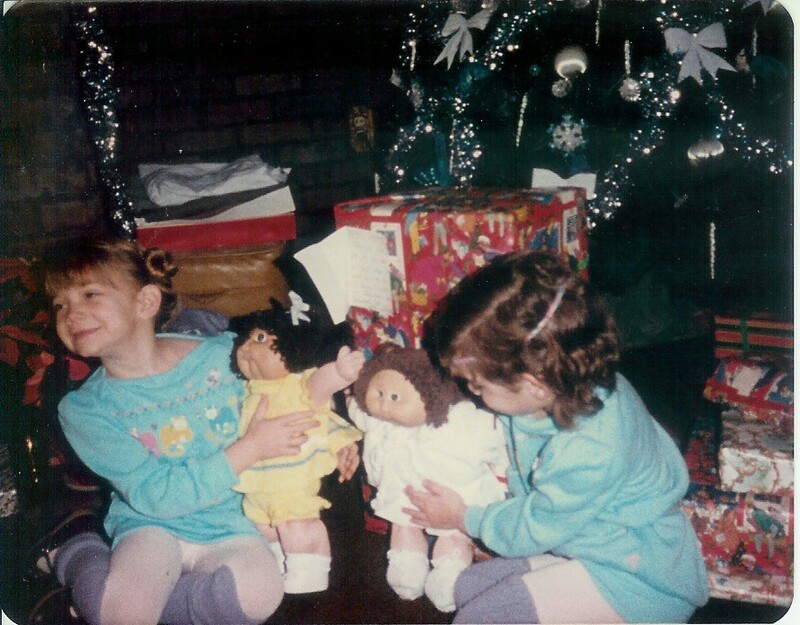 Christmas came and with it, courtesy of my youngest daughter in Florida, came two Cabbage Patch dolls for my two very special granddaughters! Me? 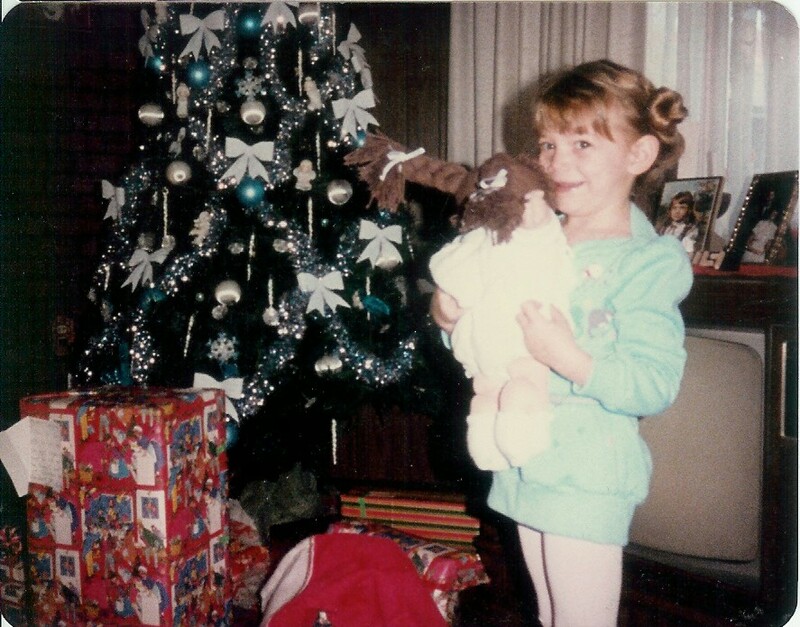 Well, thanks to my oldest daughter, on December 25, 1984, my beautiful (? 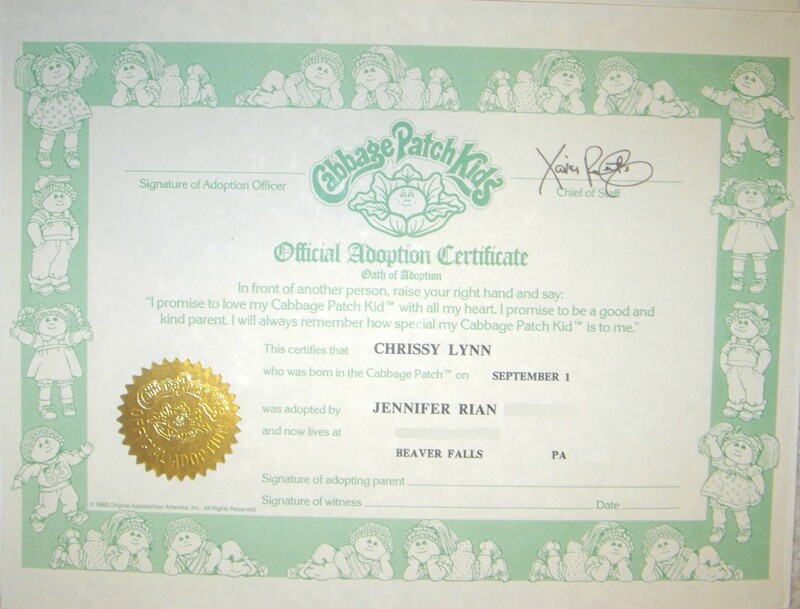 ), little Preemie, Jenny Lynn was born, and I couldn’t be happier. Of course, I still love my Precious Moments.